I've undergone a lot of sports psychology training, and long ago incorporated much of it into both my game and my coaching. During the four years I was (at different times) manager, director, and/or assistant coach at the Resident Training Program for Table Tennis at the Olympic Training Center in Colorado Springs (1985-89), the players often had weekly group sessions with the sports psychologists there, which I normally attended. Many had private sessions as well. But I think it'd be valuable for me to go back and review all the stuff I learned so long ago. At the Teams it was interesting watching the different responses to tournament pressure by different players. Here are four of them, all ages 12 or 13. All four of them read my blog (at least sometimes), as do some of their parents, so I'm guessing they'll recognize themselves! Player A was a vintage case of nervousness under pressure. He had difficulty throughout matches overcoming this, and especially when it got close. I'm going to be working with him on this as it really hampers his play as he tends to stand up straight, freeze up, and miss shots over and over that he makes pretty consistently in practice games at the club. Player B seemed on edge much of the time, but was able to play well in spite of this - but it affected his tactics as he often was afraid to attack. Especially against weaker players he'd just push, chop, fish, and lob, even if he was losing. When he'd fall behind, he'd finally work up the nerve to attack, and then he'd start winning again - and then he'd stop attacking again. He needs to gain confidence in his game, which includes attacking. Player C seemed to guide his shots early in games rather than just let them go, especially with his forehand loop, his best shot. But in contrast to most players, as it got close, he seemed to get looser, and his shots more fluid. He needs to work on relaxing early on, perhaps by pretending it's already deuce. I'm working out plans for these players so they can overcome these problems, and ideally turn them into strengths. There's a reason why so many top players say the game is mostly mental. I'll likely be assigning some reading to these players. Here’s an article that judges the relative difficulty level of various table tennis techniques, and puts them in five categories, from easiest (the counter-hit) to most difficult (topspin against topspin, i.e. counterlooping, and chopping against topspin). Here’s the essay from fellow TT nut Lorenzo Antonio Angel. Here’s a new picture of Snoopy playing table tennis. Here’s another one where he looks like Mr. Cool. Here’s a hilarious new video (2:14) of two guys who underestimate the level of play of the two girls who ask to play. The two women are Austrian stars Amelie and Petrissa Solja. The Game is All Mental. 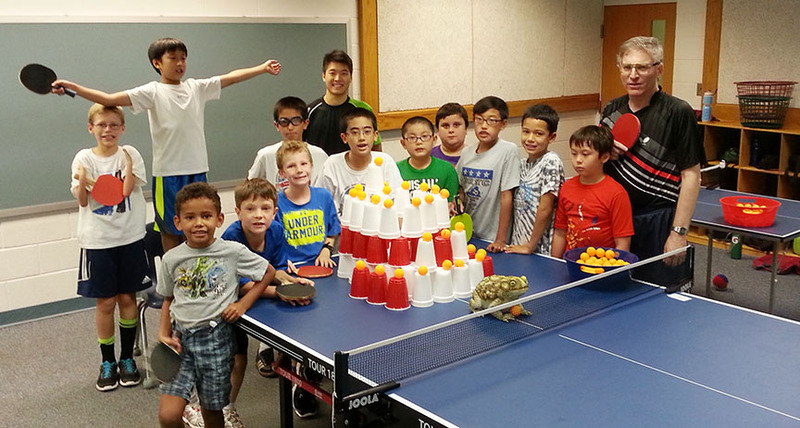 Last week was Week One of the MDTTC camp season, with 34 players. We've got eleven weeks of camps, so one down, ten to go! During break I watched the kids play a fascinating game of "24." No, it didn't involve Jack Bauer torturing terrorists who are trying to nuke U.S. cities; it involved dealing out four cards, and trying to find a way to get to 24, using all four cards and using simple arithmetic functions. (Aces are worth 1, face cards 10.) For example, if the cards dealt are K, 7, 3, 2, then (Kx2)+(7-3)=24. I doubt if they thought of it this way, but I couldn't help think how similar this was to table tennis tactics in a match, where you have only a few seconds between points to puzzle out what to do the next point, just as here they had only a few seconds to solve the puzzle. On Friday night Table Tennis Sports Psychologist Dora Kurimay traveled down from New York to give a sports psychology workshop at the Maryland Table Tennis Center. About fifteen players attended. The workshop went over the main points of her book, "Get Your Game Face On!" (Here's my review of the book on the USATT web page.) Topics included the Four R's (Reaction, Recovery, Ready, and Ritual), the inseparable relationship between emotional, mental, and physical (the "Game Face Performance Triangle"), and other sports psychology topics. If you are interested in a sports psychology workshop at your club, see her webpage. Here's a nice exhibition (2:42) by Scott Preiss and, yes, DR. Eric Owens. (Our 2001 U.S. Men's Singles Champion now is a medical doctor.) The Ping Pong Man (that's Scott) and the Doctor are performing at the Century Plaza Hotel in Los Angeles for the US Olympic Committee and Olympic sponsors. For the last few days USATT has featured on their home page a picture of President Obama holding up an ICC Table Tennis shirt. (Here's a direct link to the article and picture - scroll down to see the picture, or go directly to it.) Someone posted a bunch of anti-Obama nonsense on a table tennis forum, writing "SHAME on USATT" for "posting pro obama nonsense," and linking to an anti-Obama video that insults the intelligence of anyone with a brain, Democrat, Republican, or Independent. (Thankfully, the moderators deleted it soon afterwards.) First, this was no "pro obama nonsense," simply a neutral picture of the President of the United States holding up a table tennis shirt, a great promotional item for table tennis. Second, it's a TABLE TENNIS forum, not a political forum. Third, can't these types of people see the difference between the president, who happens to be Obama, and Obama, the person who happens to be a president they don't like? CNN did a special on "14 airport amenities that will make you long for a layover." The picture nine of them; see #8!!! Yes, it's a ping-pong table at Milwaukee's Mitchell Airport! I actually walked by it at last year's U.S. Open in Milwaukee, and considered joining in with the ones playing, but ended up just watching it. Yesterday's focus was forehand looping. In my lecture I used 11-year-old Derek Nie (rated 2146) as my demo partner, and we had some nice rallies, including looping against backspin, against block, and counterlooping. It was new to a few players, and I took these players off to the side to teach the fundamentals while the other coaches fed multiball to the others. Yesterday's "Big Game" at the end of the morning session was Around the World. I feed multiball while the kids hit one shot, and then circle the table. When they miss five, they are out. When they are down to two players, I put a target on the table (usually a box, but today I used my towel) and they take turns trying to hit it. When one hits it and the other misses, the one who hit it is the champion, and we start over. Later I fed more multiball and they had to knock cups off the table (28 of them in a pyramid), with the warning that the galaxy would explode if they didn't knock them all off in five minutes. They knocked the last one off with three seconds to spare, just barely saving the galaxy! That night I did a one-hour private session with a father and son. The son had learned to forehand loop and was working on backhand looping some, though he prefers hitting on both sides. Looping was new to the father, so we spent much of the session on his forehand loop. It's always striking watching the difference in how people of different ages learn. Younger players learn the technique quickly, but can't control it. Older players have trouble with the technique, but have ball control. Tomorrow, on Friday, June 22, Table Tennis Sports Psychologist Dora Kurimay will run a 40-minute sports psychology workshop at the Maryland Table Tennis Center. She runs the table tennis sports psychology page dorakurimay.com, and is the co-author of the book "Get Your Game Face On!" (Here's my review of the book on the USATT website.) The schedule for the night will be: 6:30-7:00PM - book signing; 7:00-7:40PM: Sports Psychology Seminar ($20, which includes a free copy of the book); after 7:40PM: Personalized Sport Psychology Consultation. Here is the flyer for the event. Come join us! 100th ITTF Certified Coach in the U.S. Here's the story from the ITTF. I ran one of the ITTF coaching seminars in the U.S. last April, and certified fourteen of them. I'm running another in August at the Maryland Table Tennis Center. Here's the flyer. If interested, email me. Come join us! Yesterday I linked to a web page that supposedly gave a historical account about the origins of table tennis. Unfortunately I found out that afternoon that the info there was dated. (I've since deleted the link.) I should have known better since I'd read the book "Ping Pong Fever" by Steve Grant, which gave the newest info on the sports origin. (I plead training camp madness - we just started eleven weeks of training camps at MDTTC, so I was a little rushed in putting together the blog.) Here is the account from the ITTF Museum, which was updated to reflect Grant's discoveries, and Grant's own press release on the subject. Who are they? Here's the story! Here's the story from the Evanston Review/Sun Times. In honor of the many summer training camps now being run around the country, here is the greatest table tennis training video ever made (2:31). I was at the Eastern Open this past weekend, coaching 11-year-old Derek Nie. Derek made the final of 11 and Under at the last USA Nationals, and came in with a rating of 2127. (He's very small for his age, only about 60 pounds, and is almost for certain the best player in the U.S., pound for pound.) He played very well this tournament. But he also had a very bad experience with an opponent who was the ultimate in bad sportsmanship. Balancing that was a revelation Derek had about the mental game. Here's a synopsis. On Saturday morning he started off at 9AM in Under 2500 against Wesley Fan, rated 2163. He didn't play well this match, and Wesley played much better than his rating, and won three straight easily. (Wesley would go on to win both Under 2250 and Under 2375.) Afterwards I took Derek aside and we practiced for an hour, the last half playing practice games. Since I know what "buttons" to push when I play him, I won all five games, but they were closer and closer toward the end. The first three we had a little fun, which helped him relax, then I told him to focus the last two games, and though I won, that's when he started playing well. I could see it, and couldn't wait for his next match. We finished the session with him practicing his serves for ten minutes. In his next match Derek played Tina Lin, rated 2233, who is playing great. This may have been the match of the tournament. By now many players were gathering around to watch this tiny dynamo who was running around the court looping and smashing from both wings, and with good serves as well. The match was a doozy. Derek won the first 12-10, Tina the second 13-11 (I think Derek had a game point), Derek won the third 11-9. Derek then went up double-match point at 8-10 in the fourth, with Tina serving. He missed a backhand smash, 9-10. They then had the point of the match. Derek started the point on the attack, looping a series of forehands. Tina blocked them back, and finally smashed. Derek fell back and fished several back, then looped one back. Tina blocked, and was again on the attack, and finally smashed a winner to deuce it. She won the game in deuce. In the fifth, Derek served at 9-all, and both times he serve and looped, but missed a backhand smash and then a loop, and Tina pulled it out, -10, 11,-9,11,9. Derek next played Nhu Phong Pham, rated 2142. Pham had gone five with Tina (also coming back from down 0-2 to force the fifth) and gotten a game from Scott. Derek won the first two, but Pham won the next two before Derek won the fifth and the match, 8,5,-7,-10,6. In the last match of the, Scott played Tina. If Tina wins, she advances at 3-0. If Scott wins, then he, Tina, and Derek are tied at 2-1, and Derek advances for sure (since he beat Scott 3-0 and went five with Tina). Even though he knew he couldn't advance, Scott fought hard for Derek and had Tina match point before losing at -8,10,13,-9,13! So Tina advanced by coming back from down double match point against Derek, down match point against Scott, and having to go five with Pham as well. Talk about your pressure play! Derek then went 5-0 in winning Under 13, winning all five matches 3-0. He was quite proud of the trophy, which he said was the "tallest" he'd won. He came off the table after one match very apologetic because he'd just played a beginning kid he'd made friends with, and leading 10-0 in the third he'd tried to give away a point, but his attempted backhand smash into the net trickled over the net for a winner. "I didn't mean to win 11-0!" Now is where things got a bit dark. In Under 2375 he faced an opponent rated about 2000 who exhibited about the worst sportsmanship imaginable - and we knew he would act like this before the match since he had a history of doing this, especially when playing junior players. I'd coached against him once before and he'd done the same thing in that match (though not as bad as this time), and other players, especially kids, said they'd had the same experience. The player had a strong backhand but weak forehand. So I had Derek go after his forehand over and over, and he won the first two games 11-3, 11-4. The opponent talked to Derek throughout, arguing about the score and other matters, but nothing major, and Derek was under orders not to talk to the opponent except when necessary, i.e. calling out the score, etc. A large crowd was beginning to gather, and they began booing this guy for his antics and cheering for Derek. In the third, it got ridiculous. Essentially every single point the opponent come up with something new to complain about, and began to bicker constantly with Derek, over and over making things up, and slowing the match to a snail's crawl as minutes would sometimes go by between points as he complained about the score, about lets he'd call after the point, that the ball was too shiny, about Derek's serve, and whatever else popped into his mind. He seemed to revel in the crowd booing him. Derek completely fell apart, unable to believe an adult would act like this and not sure how he should react, and lost that game 11-7. Between games I managed to get his head back together, but the guy kept it up in the fourth, making up new things to complain about all through the fourth. Derek managed to focus, and goes up about 7-3. They have another big argument about the score or something, and that's when I finally called for an umpire. Derek loses the next two points, missing easy shots, but finally gets focused, and wins the match at 3,4,-7,5, to huge cheers from the crowd. In the last match of the round robin, Derek plays Richard Williams, rated 2269, a very athletic two-winged looper. Derek's barely able to concentrate after the last match, but he still plays pretty well, just not like he had that afternoon when his forehand was like a "machine." Over and over he'd play nice points, only to miss the final winning shot, the very shot he'd made over and over earlier. Match to Richard, 9,-9,9,6, who told Derek, "This is the last time I will ever be able to beat you." On Sunday morning, Derek was in Under 22. He's seeded fourth in a group of five, but the top seed and fifth seed don't show. He lost the first game against Geoffrey Xiao (who seems way under-rated at 1923), but wins the next three and the match, -9,5,9,5. Geoffrey also won the first against Connor Bockoven, rated 2206, but Connor won the next three. Against Connor, Derek has great difficulty with his serves, and can't seem to control his own serves (his short serves keep going long), and the one serve that Connor has difficulty with - sorry, can't mention it here! - Derek is unable to do effectively. With Connor controlling points with his serve and receive, Derek not only spotted lots of points (mostly care of missing against Connor's serves), but was uncomfortable in the rallies. So Connor wins easily at 5,4,5. It was the only match Derek played where he lost the serve and receive battle. He now has "homework" so he'll be ready for the type of long, spin serves Connor kept throwing at him, as well as working on his own serves. Derek had a revelation this tournament. He told me, "You can't improve your skills at a tournament. So at tournaments, the game is all mental." He is a wise fifth grader. Derek couldn't play other Sunday events as his dad had to catch a flight that night to France for a business trip, and so we left around noon. Two other interesting notes. Normally the Easterns is held on Memorial Day Weekend, which was the week before. I asked why they had moved it, and was told they wanted to have Memorial Day Weekend off themselves. That's a good reason, but that meant the tournament took place right as high school students (at least in Maryland) were getting ready for finals exams, and they lost at least ten players from my club alone. I'm guessing they lost over 50 players by postponing the tournament one week. They ended up with 164 entries, compared with 227 (plus players who entered in doubles only or who paid and didn't play) last year. Also, I saw a player wearing a CCCP shirt with hammer and sickle. CCCP is Russian for the old Soviet Union, with the hammer and sickle their official emblem. I had to check my calendar to make sure this wasn't 1991, the year the USSR collapsed! On Friday, June 22, Table Tennis Sports Psychologist Dora Kurimay will run a 40-minute sports psychology workshop at the Maryland Table Tennis Center. She runs the table tennis sports psychology page dorakurimay.com, and is the co-author of the book "Get Your Game Face On!" (Here's my review of the book on the USATT website.) The schedule for the night will be: 6:30-7:00PM - book signing; 7:00-7:40PM: Sports Psychology Seminar ($20, which includes a free copy of the book); after 7:40PM: Personalized Sport Psychology Consultation. Here is the flyer for the event. Come join us! There have been five USATT Coaching Newsletters since Nov. 2009. Here's where you can read all five! "Have you ever stopped to consider how elite table tennis players deal with the pressure of competition and consistently perform at their best?" That's the opening line of "Get Your Game Face On," the new table tennis sports psychology ebook by Dora Kurimay and Kathy Toon ($4.99, available at amazon.com). It's a rather short book - I read it in an hour or two - but with lots of useful content. It covers sports psychology specifically for table tennis better than anything else I've read. It does so not just with theory, but with practical steps to improve your mental game and thereby your overall game. Dora Kurimay was a member of the Hungarian National Table Tennis Team for six years and was six-time National Champion in doubles, singles, and teams. Perhaps more importantly she has a Bachelor's degree in psychology and two Master's degrees, in Psychology and in Sports Psychology. She has a long coaching background as well, both in table tennis and other sports. She now lives in the U.S. and at this writing has a 2388 rating. Kathy Toon coached tennis for twenty-three years, including at the University of California-Berkeley for fourteen years where teams she coached won three national doubles championships. As noted in my blog yesterday, I'm doing a Service Seminar at the Maryland Table Tennis Center this Saturday from 12:30-2:00 PM. Here's the new info page! Make sure to email me in advance if you are coming so you can save $5. I'll be covering how to create spin, deception, specific serve motions, and fast serves. We'll alternate between lecture and on-table practice. Here's a video feature (12:25) on the 2012 World Team Championships in Dortmund, Germany, held March 25 - April 1. 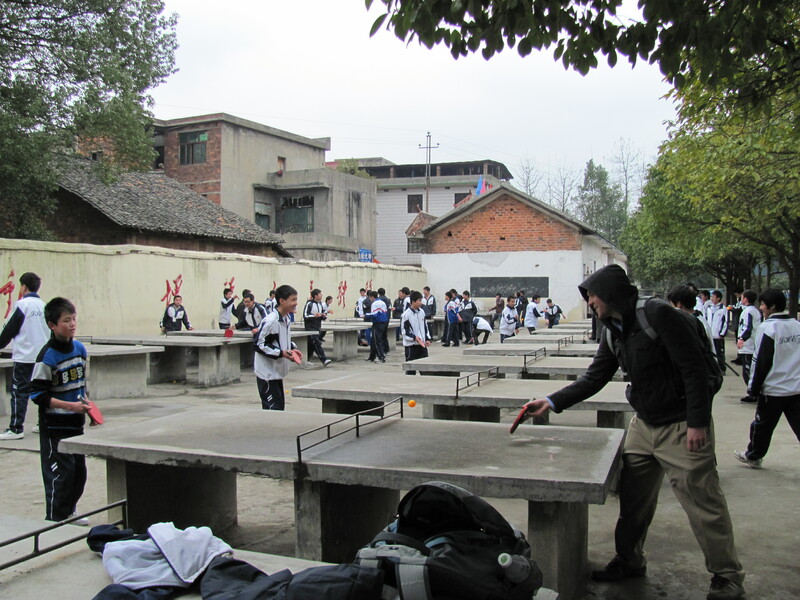 They are hoping to put up "ping-pong tables" in their Library Plaza. I put quotes around it because the tables are concrete! (See picture in the article.) However, this is somewhat common in China - see this picture.